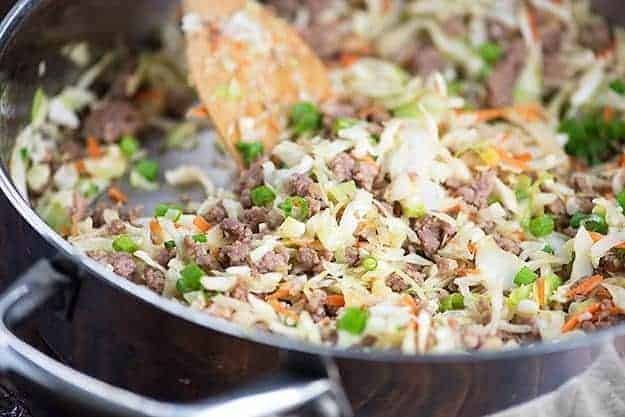 Whether you call this egg roll in a bowl or crack slaw, you’re going to love this quick weeknight dinner recipe! It’s ready in just 20 minutes and is really packed with flavor. Such a healthy option for a quick dinner. I’ve mentioned before that I’ve been doing a low carb keto diet off and on for the past 6 months or so. I lost 30 pounds in just a couple of months doing one earlier this year. Since then I’ve managed to keep the weight off and just do a week of the low carb diet here and there. I really love the low carb way of life and have created a lot of low carb recipes for you. Click for all of my low carb recipes! Well, the husband and I are having a little weight loss competition with each other (again! I won the first one!) and so I’m back to my low carb diet. It’s such an easy way to lose weight. Keep scrolling down for this egg roll in a bowl recipe! I know, it sounds so hard to give up bread and sugar, but think of what you can replace it with. Bacon. Cheese. Steak. I rarely feel deprived when I’m on a low carb diet. I’ve always said that I wouldn’t share any funky low carb recipes here that need a bunch of special ingredients. The blog isn’t changing much! 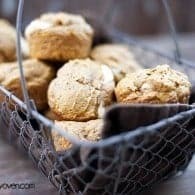 But, I do want to share recipes that fit a low carb lifestyle and will be devoured by carb lovers! Which brings me to this crack slaw! One of the foods that I really crave a lot is Chinese take out. I love fried rice – especially my bacon fried rice! Have you ever tried making fried rice with cauliflower in place of the actual rice? It’s really good too – try my cauliflower chicken fried rice. This chicken stir fry recipe is a great take out fake out too! But, let’s be real. Egg rolls are where it’s at. I’ve shared our favorite homemade egg rolls with you guys before, but the wrappers are loaded with carbs and frying egg rolls is pretty time consuming. That doesn’t stop my husband from begging me to make them all the time though. He’s a pretty big egg roll fan, too. So, to lighten things up and keep our dinner a bit healthier, I basically just made the filling, dumped it in a bowl, and ate it with a fork. This might seem a little strange, but you guys. So filling and so good. This recipe really satisfies that Chinese take out craving! 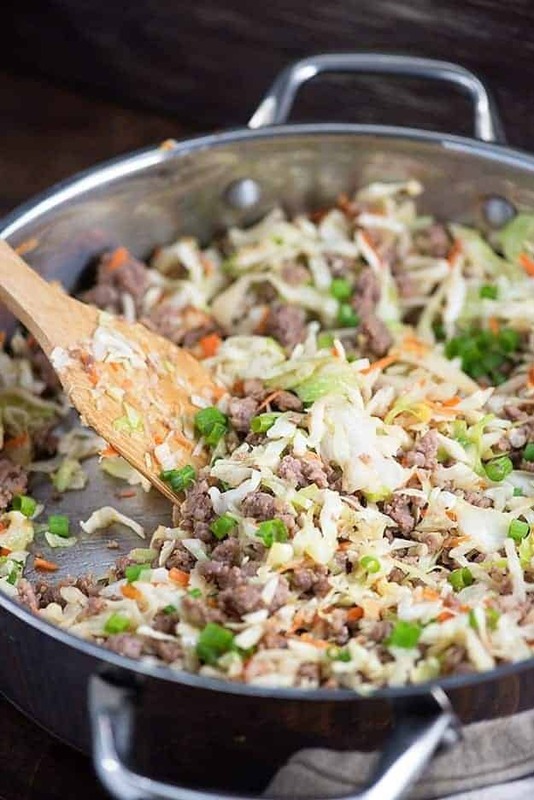 This crack slaw is the perfect low carb Chinese food. I seriously could not get over how much this tastes like an egg roll. And my word, it’s so much easier than actually frying egg rolls! This dinner clocks in at less than 400 calories, 5 grams total carbs, 3 net carbs, 23 grams of fat, and 23 grams of protein (with the disclaimer that I cannot guarantee this information is accurate. It was calculated on My Fitness Pal’s nutrition calculator and your mileage may vary). It’s pretty perfect for a low carb dinner and it’s super filling and just packed with flavor. Best part? It’s done in less than 20 minutes. You could absolutely swap in some ground chicken for the sausage and you’d save some fat. Low carb diets need fat though, so this is perfect for me! I also love this recipe made with ground beef. I’m not normally a huge sausage fan, so I often do a mix of both sausage and beef. 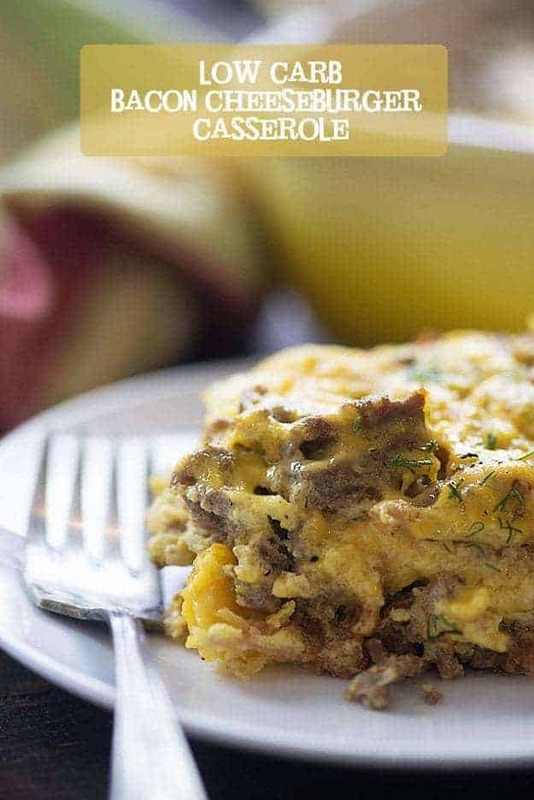 Some of our other favorite low carb recipes include this cheeseburger casserole, low carb stuffed peppers, and my low carb chicken salad. My low carb meatloaf is pretty rad too and it’s wrapped in bacon! There is no egg called for in this recipe, because egg rolls aren’t traditionally filled with eggs. 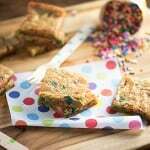 The name actually comes from the wrapper – it’s traditionally made with egg, flour, and water! That said, if you wanted to bulk this up or stretch it to feed more people, scrambling in some eggs or topping it with a fried egg would be total perfection! If you’re not super strict on carbs, fried wonton strips add a great crunch too. 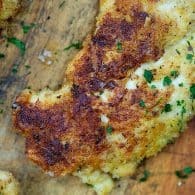 Hope you guys love this recipe as much as we do! Whether you call this egg roll in a bowl or crack slaw, you're going to love this quick weeknight dinner recipe! It's ready in just 20 minutes and is really packed with flavor. Such a healthy option for a quick dinner. We reheat it, and it is still great. Just dont nuke it on high. Use power level 6 or 7. I make this once or twice a month. Can someone tell me . . . Is minced ginger something you find in the spice aisle? Or do you buy fresh ginge4 and grate it?! Thanks! You can usually find ginger paste in the produce section in a little tube. Otherwise, I’d recommend fresh ginger that you grate or mince yourself. Dried ginger isn’t going to pack the same punch in this one. I LIKE YOUR RECIPES BUT WISH YOU HAD THE JUMP TO RECIPE CHOICE. You could try using Chinese sausage. You can find it in most grocery stores. Just remove it from the casing. what would you consider sausage for this recipe? 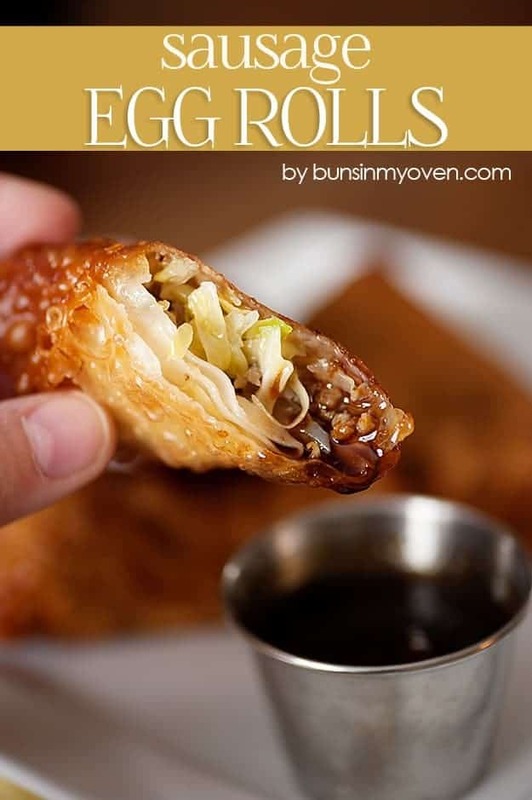 I have always wanted to make something like this because my kid just eats the filling out of an eggroll anyway and I am low carb. Is it breakfast sausage, italian sausage, or just plain ground pork? I use breakfast sausage, but whatever you like should work fine here. It’s good with ground chicken and beef as well. Love your recipes. I am a glucose intolerant diabetic. I also have congestive heart failure and need to wat h my sodium intake. I will try your. Crack slaw, and try to reduce the sodium. Thank you for your wonderful week night ideas. It says how many calories in a serving, but it doesn’t say a serving size. What is a serving? I could sit and eat a whole dish! I too need to watch salt intake due to congestive heart failure — what would you suggest instead of soy sauce for flavor? Isn’t that where the huge amount of salt comes from? Also did you know that you can use ground pork instead of pork sausage (there is a big difference –fat) It has much more flavor than ground beef & very lean –(think loin) I am anxious to try a no or low carb meal as a diabetic. You could try a low sodium soy sauce or check on the sodium content of coconut aminos. Not sure how it compares as far as sodium, but it’s a good swap for soy sauce. Made this today. Delicious will make again . And you could add some wonton (store bought or homemade) strips to it for some crunch! I really loved the flavors in this dish. My only criticism is that it is pretty small portions. I ground my own lean pork and used low sodium soy sauce. The flavors were delicious and spot on, we were all just left still hungry. This would go great with pot-stickers piled on top and I think you could even get away with a lot more veggies. As a main dish I would say this serves 2.5, 2 dinners and a small lunch when prepared as is. I just asked about that! I wondered if it was a filling dish or if we would be hungry still. Good to know, thanks for sharing! Is this recipe filling? It looks delicious to me, but I feel like my husband would still be hungry after eating it ;). Would you suggest anything to go with it? I am a forced to cook kind of woman and found this to be an amazing recipe. 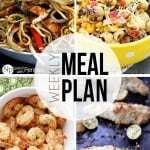 I liked it so much that I started following this blog, made the breakfast casserole and the million-dollar spaghetti squash casserole. I am definitely not a cook And found these recipes simple To follow and very tasty. I can’t wait to try some of the other low-carb recipes. This was delicious! I made a double batch and added a half of a yellow onion, thinly sliced, and about a pound of thinly sliced crimini mushrooms. I had to use ground ginger as my local grocery store was out of fresh ginger (can you believe that!?). My whole family loved it and gobbled it up. My husband added some rice vinegar to his because he loves it. They asked me to add it to the menu again next week! Thanks for the tip! This was even better! Like a low carb fried rice. I could eat this all of the time! Have a great day! Have you tried cooking it in a wok? No, but it’d be fine if you did. I used Turkey sausage instead of pork. I added a little sesame oil when heating up the sausage. It was a hit. We don’t eat pork. I made this tonight for dinner. I doubled the ingredients (but not the spices because I wasn’t sure if the kids would like the flavors) and it turned out great! It was a bit bland, so next time I will make it and double everything. Very easy and really great with fresh ginger root! Thank you, we all loved it! Could you use Hamburg instead of pork? Yes, ground beef would work just as well. While I would eat this recipe as-is, I have family members that would prefer the egg roll. How would this filling taste fried in won tons for those who want it that way? I have a similar recipe for sausage egg rolls, but you don’t cook the cabbage. You can find it here. I thought this recipe was delicious. I used steak in place of sausage. This was delicious. I added some Korean gochujang for heat and it was perfect! Karly .. such a fun site you have created .. thank you .. I just found you recently .. in the last month .. and I’m captivated with your recipes .. thanks for inviting me .. I just subscribed to receive your emails .. Happy cooking and ‘baking’ ..??? Hi! I’m confused a bit on the macros. If I use 80/20 ground pork, a serving of 4 ounces has 280 calories, 17 grams of protein, 2 carbs, and 22 grams of fat. A tablespoon of sesame oil divided by 4 can’t be the issue. Is this maybe off? Thanks in advance! Made this tonight and absolutely loved it. 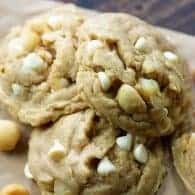 Thank you for posting such a delicious, fast, and easy recipe. I am definitely going to try adding eggs next time. My fiance who is lc loved it too. This recipe will be in regular rotation in our repertoire. Can I just use ground pork with this instead of sausage? Use Chinese Five-Spice. It really makes a difference when just using ground pork or beef. Made this it was so good, my husband loved it! Will make again! I used breakfast sausage worked fine. Grated fresh ginger… yummy! Was so easy and good! thank you! We loved it so much that I had to make it again the next week. Bought more coleslaw mix again today for this weekend. Thank you for all of these delicious recipes, will be following you for sure. You have made cooking fun again, was getting tired of the same old stuff and no one would suggest anything else to make. A family favorite! Great for my celiac child and my low carb husband. I’m going to have to start making double batches as the teens inhale it lol. 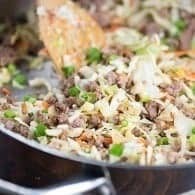 I double the sausage, triple the cabbage shreds, and add a few whisked eggs toward the end of the cooking time with a few splashes of soy sauce whisked in. This bulks up the dish a bit, and easily feeds myself and my three men (hubby and two teenage boys.) I’ve used ground ginger from my spice rack in a pinch, and it’s still delicious! Love this when we’re cutting carbs! This is very tasty, inexpensive and easy to make. I loved the taste. The only comment I have to make is concerning the nutrition information. True, this dish is very low in carbs, which is a good thing. However, I encourage anyone making this dish to look at the entire content. It is VERY high in fat, cholesterol and sodium, which should be of concern to everyone with weight or heart-related concerns.